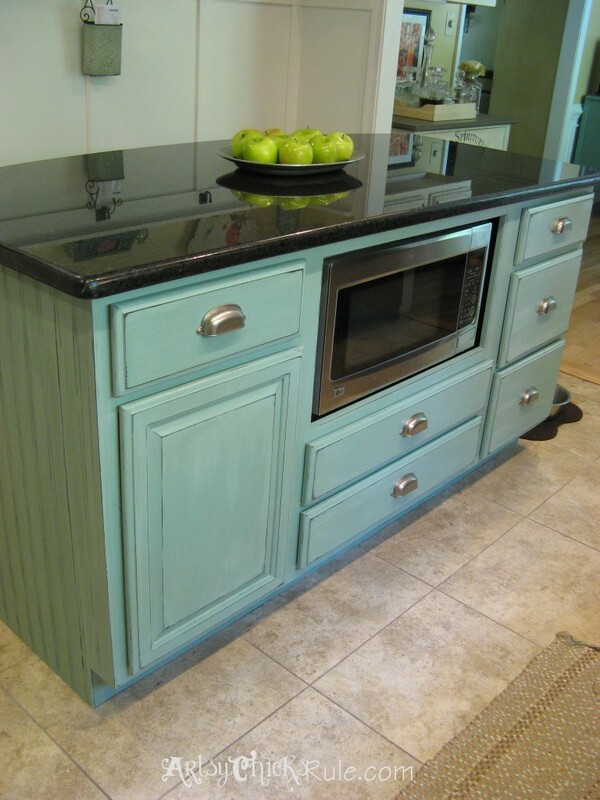 Painting your island can really add a fun design element to any kitchen. 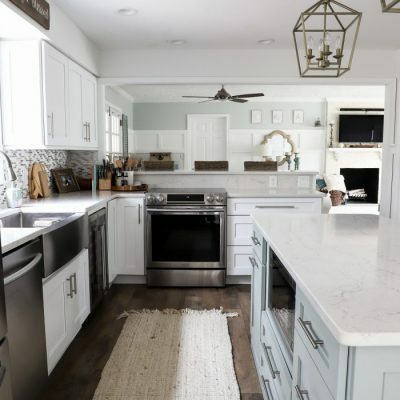 I’m sharing this kitchen island makeover that did just that! Awhile back I posted about painting my kitchen island ….again. I was a little unsure since I had only recently painted it black. And so…. I couldn’t be more thrilled with it. ….even I, who loves color and is not afraid of color, was a little afraid of this color, on this island. I almost painted over it immediately which would not be unusual for me. But I let it grow on me (thanks to some well timed intervention — from my hubby and awesome sister in law)…and it did, quickly. I have to say I truly did like the black but I wanted a splash of color in this room…and a big one. This was originally an eat in kitchen and we had a small table in that back corner. We removed a full wall on that side and a half wall on the opposite side (see the full kitchen reveal >>>here) and put the island in. EDITED TO ADD (2018): We are giving the kitchen, this island and the whole downstairs, a brand new makeover. Stay tuned for another kitchen island makeover and the full kitchen/home reveal coming soon. The island was made from 3 pre-made cabinets at Lowe’s. I will have a post on how we did it and how we re-worked the middle cabinet to accommodate the microwave at a later date. 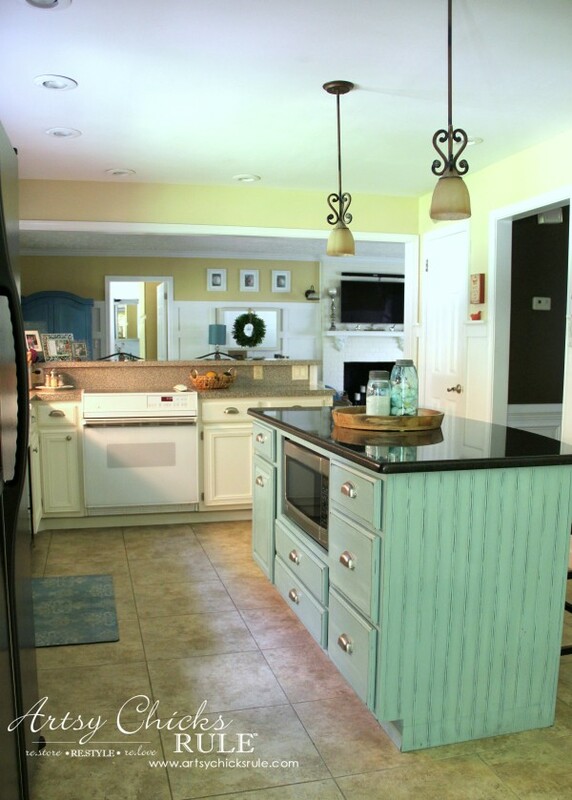 And I have to show you the kitchen before the island and before the wall removal…. Basically same view (back corner) in all photos in the collage below…what a difference, right?? Yea, plaid, lots of plaid…and it was SO DARK. 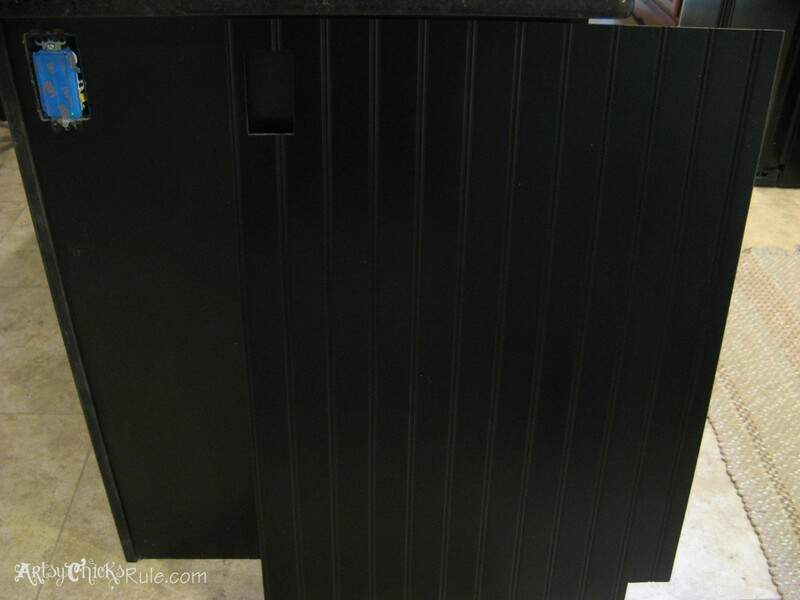 Plus dark wood cabinets, dark wood trim, dark wood doors, dark wood paneling. Makes for a very dark house! 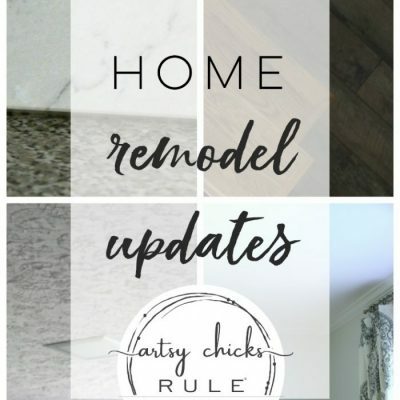 This house has gone through MAJOR changes and I can’t wait to share all the before/afters. (want to see a few more photos of this wall removal/kitchen demo? 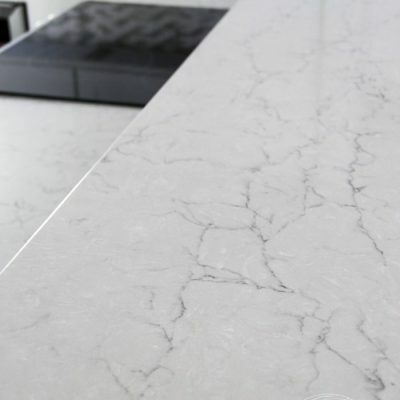 But first…back to the kitchen island makeover. Since we made the island out of ‘ready to go’ cabinets from Lowe’s they were unfinished on the back. So we decided to put paint grade bead board up and I would stain it to match. 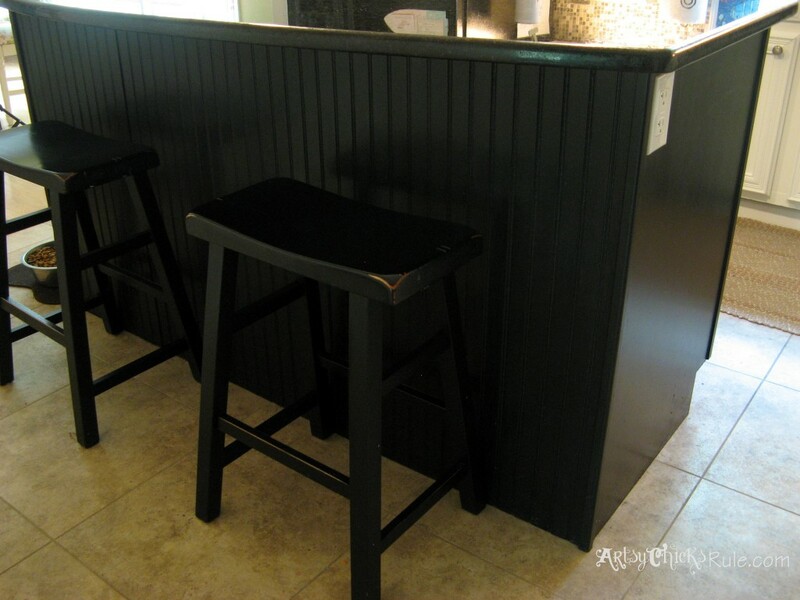 And nope, I could not get a good match…so I came up with the idea to just paint it black like the granite we used on top. Not ideal, of course, but putting the island together this way saved us a bunch. 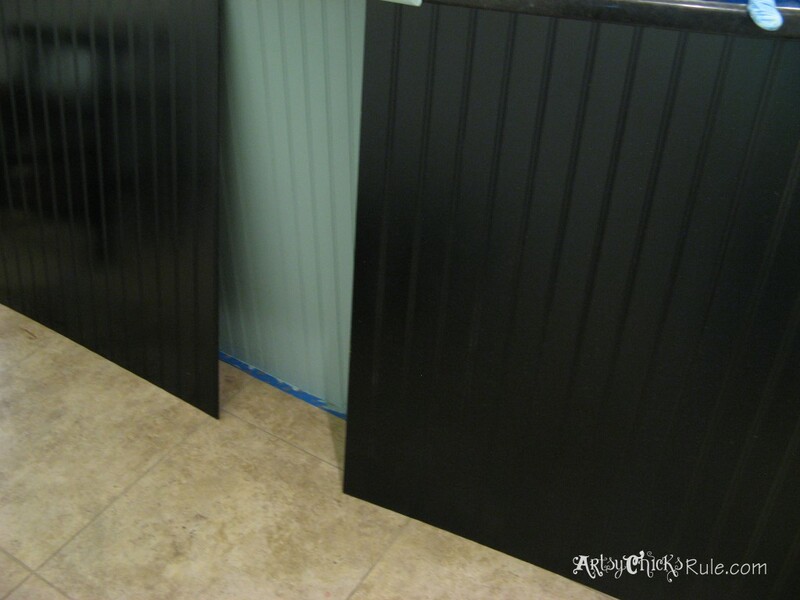 See the smaller picture below of “before” when the sides & front were Cherry stained and the back was black. When I decided to paint the island in the Duck Egg, I thought it would be best to put bead board on the smooth sides to have continuity with the back. Plus I like detail and thought the flat panels on the sides would look boring/plain. We did a quick spray with black spray paint (they were white primered) so once painted with Duck Egg they would distress the same with the black showing through. The back bead board was some sort of paint grade and the wood was not nice and smooth like the new we had just bought. It was rough-ish in the groves and looked terrible once painted a lighter color. Soooo….we covered it up with the same new panels we used on the sides. I know it looks exactly the same in the picture…but TRUST me when I say, in no way were the these finishes the same. Nailed & glued in place, painted and distressed. Here’s a fun little surprise….when I used the wet sponge to distress on this Duck Egg Blue Chalk Paint I got a “washed” effect. And I love fun surprises like that. Oh, and those are the rest of my kitchen cabinets in the photo above. I painted them in a blend of Pure White/Old White Chalk Paint. And yes, I painted them twice in one week…because my mix had too much Old White (too yellow) first go round. Yep, painted, sealed, repainted, resealed. But I knew it would drive me crazy so the only thing to do was jump right back on it and get it done. So I did. I decided to use a poly to seal this island (and my other kitchen cabinets) since they are in the kitchen and will get a lot of use. We refinished our wood floors last year and the poly I used to seal the floors is fantastic. I have used it several more times since on various projects. It is HARD and hard wearing. 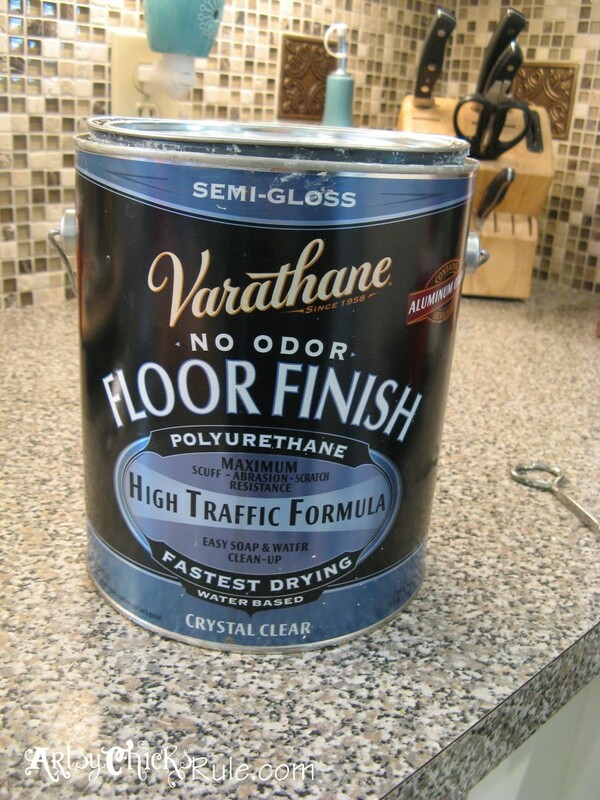 Varathane Floor Finish….Water Based. It’s really good stuff. So there ya have it! I did it. I painted my island and I know that not everyone will love it this color…but I do. It feels so happy, bright and cheerful in this kitchen. ….and the Chalk Paint really did make it a breeze to do! What a difference a little paint & color can make…oh and new hardware too. 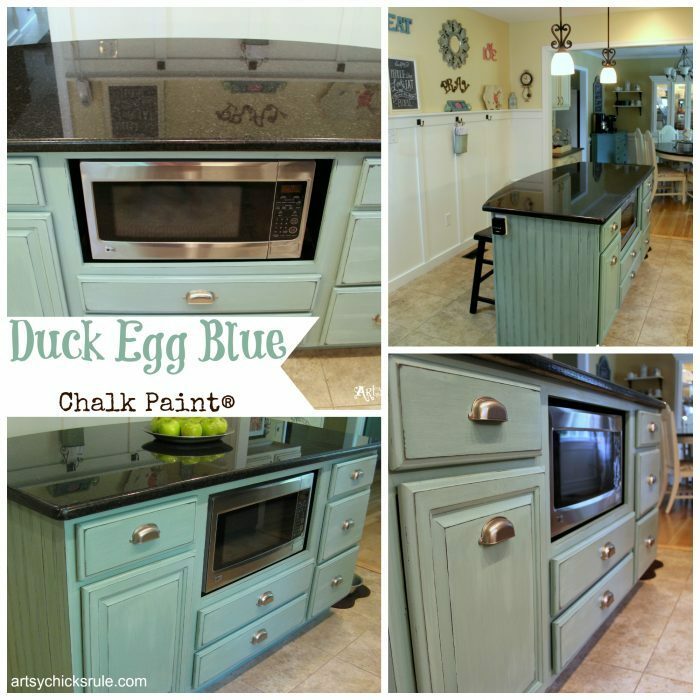 Isn’t that Duck Egg Blue Chalk Paint beautiful? One of my favorite colors! What do you all think? Do you like the black better? Or maybe the Cherry colored wood? 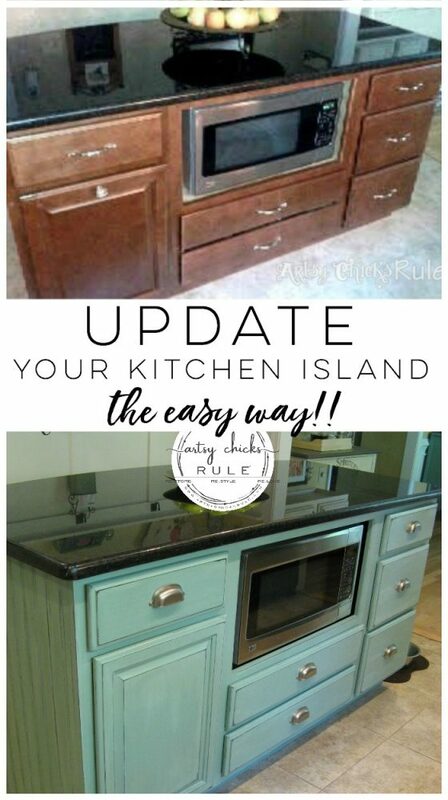 Want to know how this island (and my kitchen cabinets) held up with Chalk Paint….4 years later?? 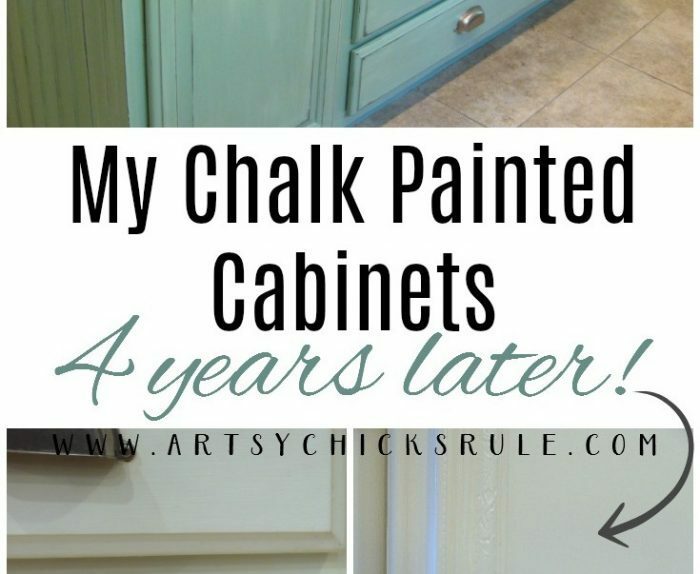 Check out this post here >>> My Chalk Painted Cabinets – 4 Years Later! 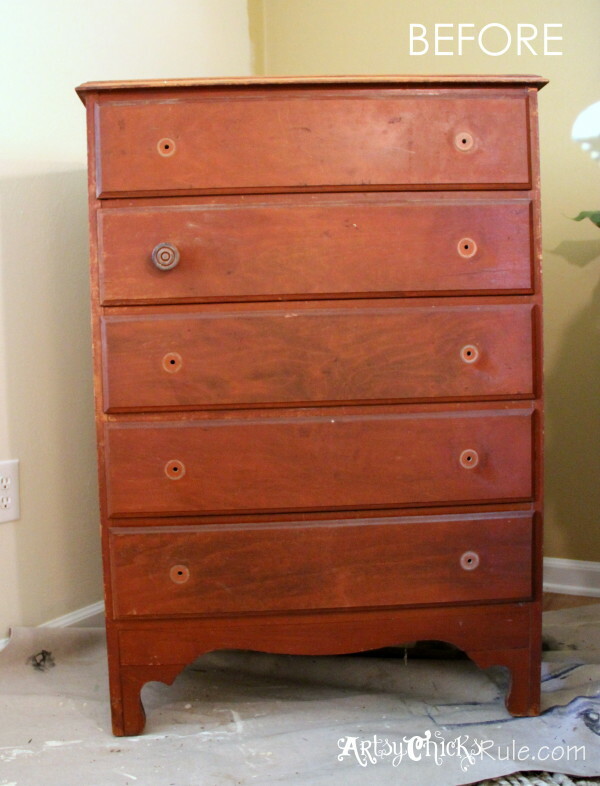 Be sure to check back in to see how I gave this old chest a much needed update! I LOVE this color and it looks amazing on your island!! Nancy, I simply love the island now. Before the black was a little overpowering. You did a great job. I’m sharing this post. I think it looks very pretty! I am getting ready to paint my island too! How weird! Thanks! OH funny…what color are you painting yours? LOVE your island Nancy – that colour is fabulous. I have dreamed of a blue island for a few years now… we don’t actually even have an island. But think I might be painting my lowers blue soon and the uppers white… was thinking chalk paint too and sealing with Varathane. Glad to read your post about it! Thanks Krista! Oh that will be a great look. The Varathane is fabulous. I have been thrilled with it on our floors and it’s been wonderful so far on the cabinets and island. Can’t wait to see your kitchen! Hi. I love everything you did. 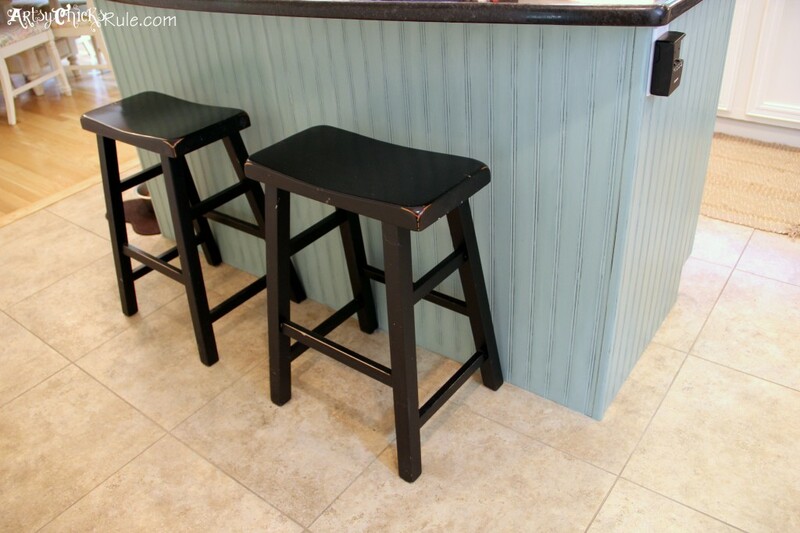 Question: the clear coat you put on island and cabinets, did you wax the chalk paint first? Did you brush or roll it on and did it look really shiny once done? No, I didn’t wax at all. I only used the Varathane to seal. I used a brush (good quality bristle brush- Purdy) and no, not too shiny. I used Semi-Gloss because that was what we had left over from the floors. I usually like to use Satin but the Semi-Gloss is perfect (in my opinion) for cabinetry. Hi just curious how the finish is holding up these days since its been almost a year? I am considering doing a similar thing. I will look for it in my sent box and resend to you. :) Be on the lookout for it! Beautiful! 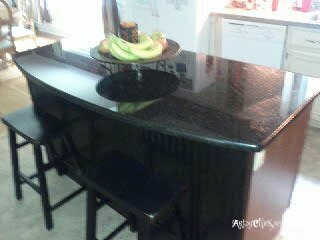 I look the color with the black granite! Gotta love my favorite ASCP Color – it fits perfectly with your kitchen décor – very nice! I love to see a pop of color on kitchen islands. So cute! 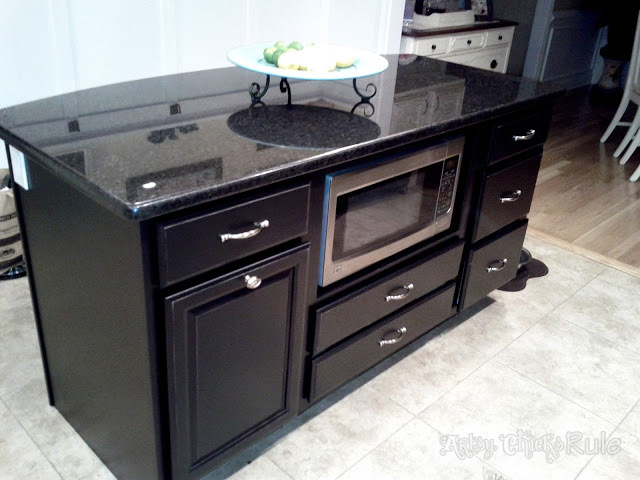 Beautiful color choice with the black granite! Love that washed effect! And also admire how brave you are to make so many changes :) The effect really lightens up the kitchen and makes it look amazing! Yes, me too! A fun, happy surprise. :) And yes, there is not too much that I am afraid to do! ;) Thanks so much! Love the duck egg! The black was too much with the black countertop. 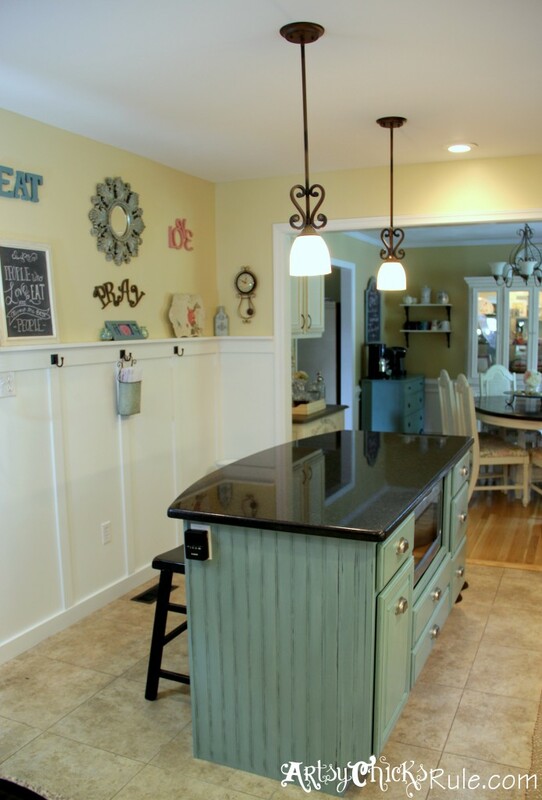 I love your kitchen with the the wainscoting and wall and your cabinet color! Gorgeous! Thank you Mary! :) It seems that a lot of people think the black was overpowering…and I think I agree! :) This color looks (and feels) so much better in the space. Oooh I LOVE the Duck Egg! The black was really pretty too, but the blue totally makes a statement in the room. Great job, Miss Nancy! Have a wonderful week! I love it! It looks really great! I am looking for a color to paint my island, maybe this might be it! Hi! I just painted my island with a chalk paint.. But when I try to antique it, every stain or glaze I use makes it look a dirty and greenish yuck color :( help! Yours looks amazing! 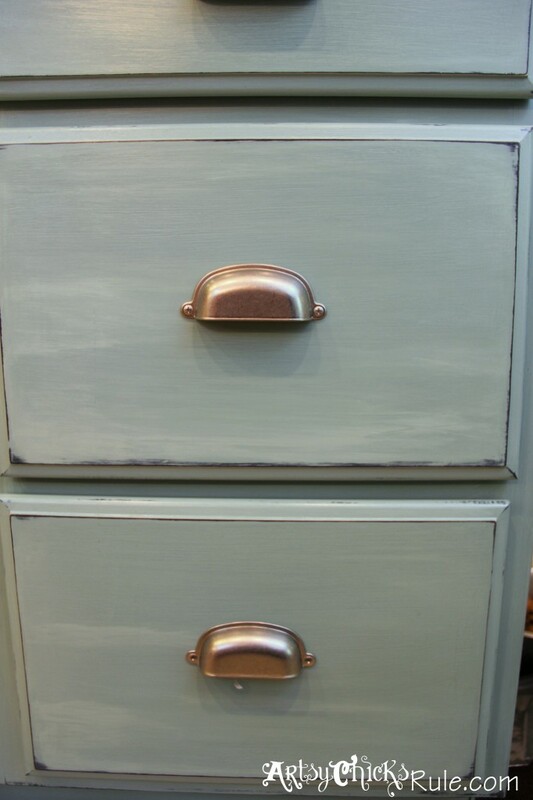 I really want to paint my Pantry Doors this color with a distressed look. What’s your advice on painting them and distressing them, not sure about Glaze to make the distress look pop. I want to paint my Pantry doors this color and distress them. Not sure if I should use Glaze to the distressed areas. What’s your advice?? I never have done this but my husband has. I know that’s a lot of different techniques but I hope it helped and maybe gave you an idea or two! Any advice on this matter would be appreciated!! For the Varathane, I used a Purdy bristle brush. One coat. As far as cure, I can’t really say for sure. I always like to be super gentle with anything I paint like that for about 30 days. They dried fairly quickly and were put back together, doors etc, the next day. If you’ve been using ASCP for a few years than I am confident your cabinets will turn out beautifully!! Good luck!! Hello! Beautiful kitchen. I painted my cabinets in annie sloan old ochre. It is too creamy and off white. I want to repaint them to be whiter. I have some pieces that are old white and I love them. What is your mixture of pure white and old white? What parts of what? Also, I have painted some furniture pieces in the past (a creamy white color) and we used wipe on poly and it turned them yellow in a matter of a few weeks. Has what you used turned yours yellow? And have you ever heard of that happening? I used the annie sloan clear wax on mine now, but I want them to be shinier and I think what you used would be the trick, just don’t want it to turn them yellow after a while. Also, if I distressed a little would I do it before or after the floor sealer? Thanks so much for your help! Thank you :) I am sorry, I don’t really have exact measurements. But I can tell you it is mostly Pure White with only a bit of Old White. (the first go around I did it more 1/2 and 1/2 and it was too yellow). Yes, oil based poly has a tendency to turn things yellow so it’s best to use that only on darker painted items. Water based polys are better for lighter colors since they don’t tend to yellow as much. The Varathane that I used has been great with no yellowing. I have had good luck with Minwax Polycrylic too. The only problem you have now is that you have applied wax. You can’t put the poly over the wax. You would need to remove the wax (sand down past it) and repaint then poly. You could try painting over the wax with Chalk Paint (it will adhere to the wax) and then putting poly over that but honestly I would be nervous about durability because of that under layer of wax. If you want them to be less yellow you could certainly paint them with a whiter mix and just re-wax them no problem. As far as distressing, I always do it before applying the finish product (wax or poly) But you can do it either way. Nancy – I have been on your blog several times and just love it! I wish I could win the lottery or something and then I would pay for you to come re-do my home (I live in Texas). I love everything about your home. The colors, your decorating style etc. I’m wanting to redecorate my home so you have given me the inspiration to just jump in there and make the change. I am so tired of what I have. I WANT COLOR! :) Thanks for all your postings. You are doing a great job. Aw thanks so much Bonnie!! What a sweet comment! But I also did it on the cheap. Most of everything that I re-decorated with came from a garage sale or thrift store, small decor items to large furniture. It can be done on a major budget! 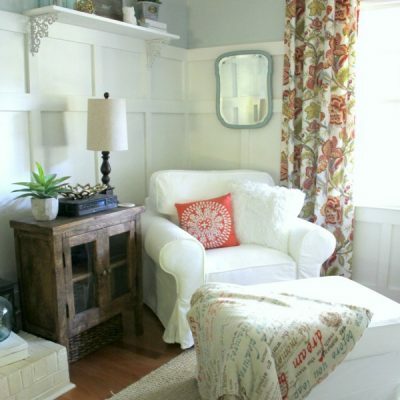 I am actually going to do a series of posts for each room pointing out what and how I redecorated each one on a budget. (I have a few decor things to finish before I do though!) But I am really excited to share that with my readers. Thanks again for the sweet words. I cannot tell you how they made my day! Your cabinets and island look beautiful!!! 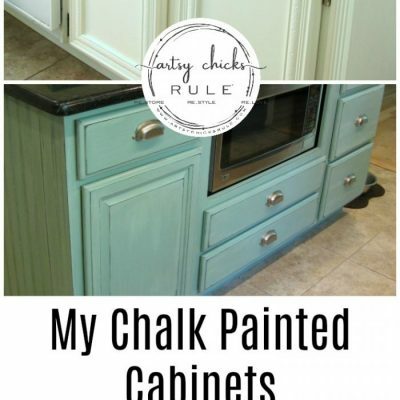 I’m in the process of chalk painting my kitchen cabinets too and I have a ton so I don’t want to wax them because it’s too labor intense and I don’t want rewax them every year. Did you have a problem with bubbling using the poly to seal your cabinets? Some people used lacquer so I’m curious about that as well. Any advice would be helpful!! :) thanks! 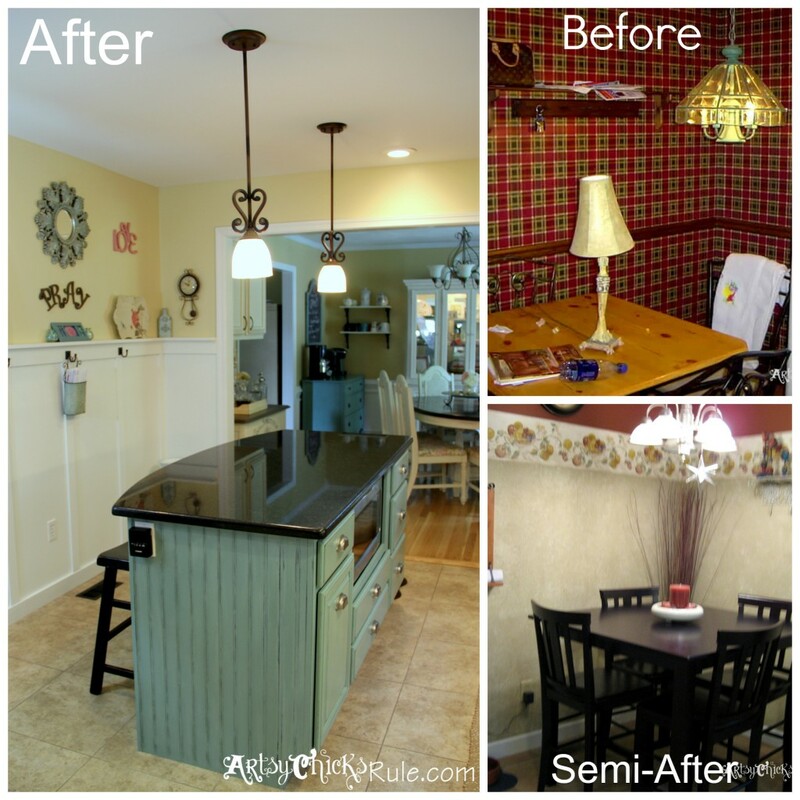 Love your cabinets and island make-over. I am wanting to use ASCP on my kitchen table and am curious if this sealer is safe for that. I figured I needed something better than just wax. I have never used any ASCP so any thoughts would be great. Thanks! Thank you Leslie! From my experience, and all I’ve read, most polys are safe once cured— BUT I would check with the manufacturer to be sure. I used poly on my kitchen table redo (sanded/stained/poly’d)..and most tables, etc, are finished with it. Your cabinets look beautiful! I want to paint my kitchen cabinets too. How many quarts of ASAP did you use for the cabinets? I’m just trying to figure out how much I would need. Thanks! Thanks so much! I used somewhere between 3/4 to 1 can but keep in mind that I didn’t repaint the insides of the cabinet this time. Plus it will also depend on how many cabinets you have. But it really does go a long way! I love your posts and am about to paint my light maple kitchen white (3/4 pure white and 1/4 old white like you did!). I have a great dark wood(ish) console table that I want to make beachy/chic for my living room and I wanted to explore the duck egg blue color. If I mix some duck egg with pure or old white, will I get a very light duck egg color? Thanks! Quick question — I painted my cabinets with latex paint. I followed all the steps (deglosser, coverstain oil primer, and then the latex) It was been a chipping nightmare. I think I should have used a top coat like the one you mention here. It’s been two years since I painted the cabinets. I was hoping to fix the chips with the same latex paint and then put a poly on top. Can I do that or will it not stick because it’s been two years since I painted? I know that I will need to clean them well with dish soap and maybe deglosser? I think the problem is probably the deglosser. I like to use that occasionally on furniture but I wouldn’t for something like cabinets that will get a lot of use. Sanding first is still the best option there, in my opinion. Thanks so much for your quick reply. I was afraid of that. 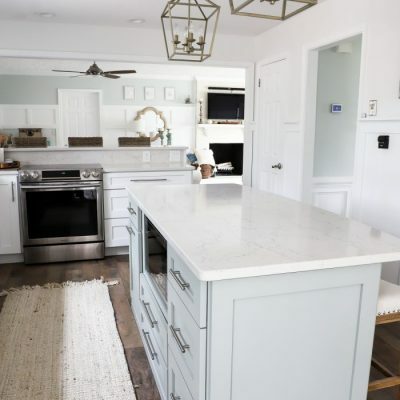 There are so many blog posts that claim you can paint your kitchen without sanding your cabinets. I knew I shouldn’t have listened and taken the easy way out. Also, I was originally planning on painting my cabinets in oil paint, but I’ve heard it can yellow or time. I really like how well oil paints hold off and have such a hard finish. I am going to start with the island, sand it down, clean it up, paint on coverstain and then probably a few coats of oil, light sanding in between for “tooth.” Ugh! it’s so important to consider the source with these blogs and pinterest pins these days. Oh well, maybe my story can help others at least. How funny about the description of the paint!! In my opinion, it definitely can have a slight warm, yellow-ish cast. Which is not necessarily a bad thing at all, just not what I want at times! I have been looking for the right yellow to paint my kitchen and I really like your wall color.. can you tell me what the name of your paint is ? thank you! I also bought the ascp duck blue egg thanks to you! can you recommend a ascp color something a little brighter and maybe deeper tone than the duck blue egg? Brighter and a bit deeper toned…I would try Provence. It’s a gorgeous color. It’s a bit richer and has a touch more teal/blue in it. If you are thinking even darker, you could try Aubusson Blue (my all time favorite color in the line). You could even try mixing shades (which I do all the time!) to come up with the PERFECT shade for you. 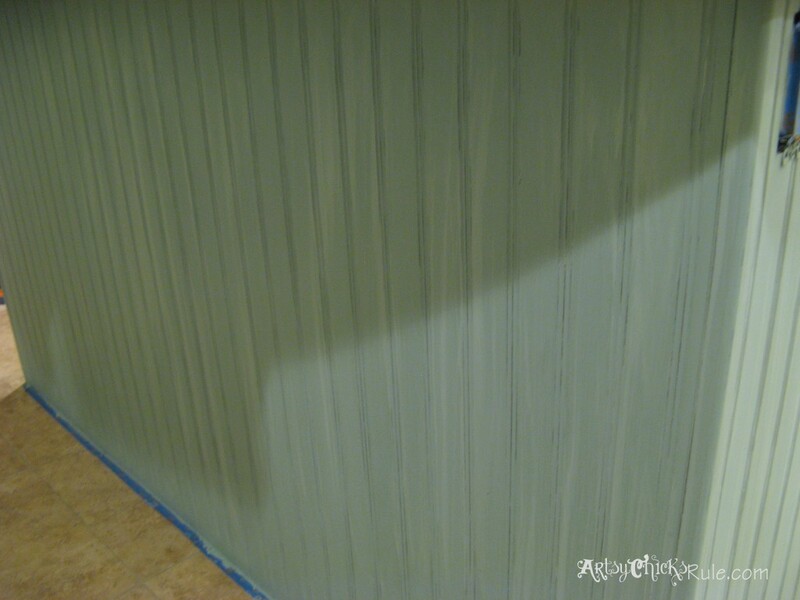 The first beadboard we put up was the stainable kind because I was originally planning to stain it. That didn’t look so nice painted to we went back and bought the smooth, primered board to paint. It wasn’t plastic board but it did have a very smooth finish. Hope this helps! 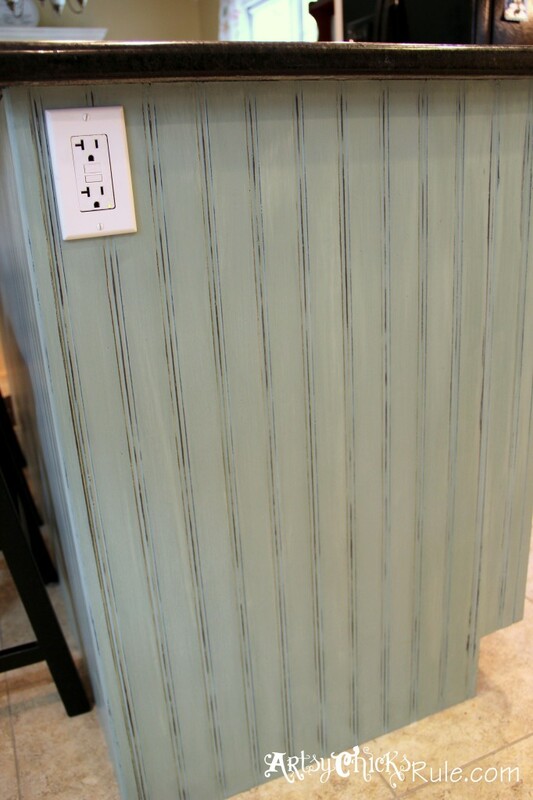 I am about to paint my kitchen cabinets with Sloan chalk paint. I’ve been testing colors and decided I like a color with the dark wax over it. I would like to then seal it with a floor sealer like you did for durability. Once the wax cures, do you think it’s okay to put a sealer over it? I know this post is old, but I’m hoping you’ll still be able to answer. Thanks! No, you actually can not put the poly over the wax, it will not adhere. You can either wax only. OR you can apply poly and then do a glaze type of finish over that to give a similar look the dark wax would give you. Did you apply the varathane with a brush? If yes, what type of brush did you use? Yep, I sure did and I usually use Purdy brushes. They are my favorite. I love the combination of colors and textures you’ve accomplished here. I have a similar kitchen with similar 14x 14 tiles, with same color now dirty grout which I hate. Do you have any ideas on doing something with the floor tiles, or grout color to update the floor ? Would you consider darkening or lightening the floor tile grout or even painting on the tile ? I wouldn’t lighten them because I’d end up in the same place down the road. I also wouldn’t paint them. I do have a question….what is the name of your black granite? Does it finger print or show dirty all the time? You may have already answered somewhere but I didn’t see it. :) Thanks! Um, it can look smear-y I guess, but easily cleaned! I use the granite cleaner/sealer and it works like a charm. I too love your island. 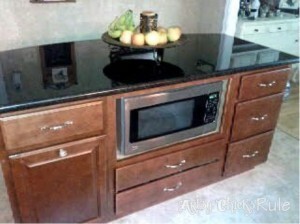 Can you could tell me how you and your husband reworked the middle cabinet to house the microwave? Hi, Nancy. Love the chalk paint technique you did. Quick question. Did you use the wax finish and then use the Varathane Floor Finish over the wax? No, I used the Varathane in place of the wax. You cannot apply the poly product over wax, it won’t adhere. First off, I love pretty much everything on your site! I’m just starting to explore the world of DIY and upcycling/refinishing furniture. I’ve tried using polyurethane, both water and oil based, on a couple different pieces, but I’m having a really hard time applying it smoothly (brushes always leave streak marks, rollers give me bubbles, etc). What is your trick for sealing things smoothly? Aw thanks so much! I really like Purdy brushes. A couple tips, be sure not to shake the poly in the can as it can add bubbles. When using a roller, try to go slowly. If applying with a brush (again, I recommend Purdy) be sure to use enough product and apply with a light hand. That should alleviate most of the brush mark issues. If you apply too thinly it can leave brush marks. Also, be sure to very lightly sand in between coats. 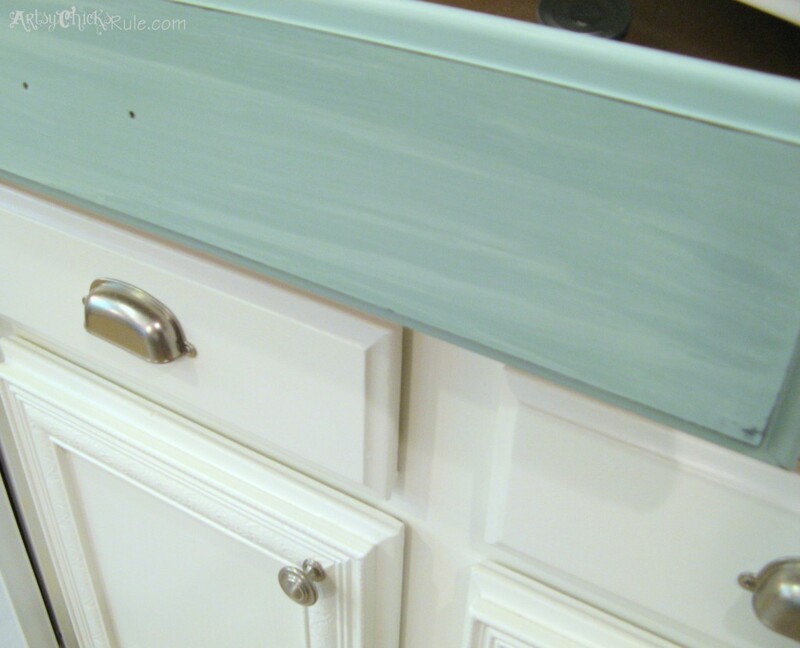 I just painted my lower kitchen cabinets with Annie Sloan Duck Egg Blue. I am struggling with the waxing process. It is changing the color and looking splotchy. Did the sealer you put on make the color darker? Help!!!! By the way, LOVE what you have done!!! Yes, the wax and/or the poly will make the paint look darker. It’s just the nature of Chalk Paint. You should feel proud of yourself. You put a lot of hard work and TLC in to your project, but it looks beautiful. You remind me of myself. I paid someone to take the doors off of one of my kitchen cabinets and paint the inside. After he left, I redid the whole project a completely different color. Very happy with the results, but if was tough getting it. I would love to do my island too. Need to think about a color and if I want to take on such a big task. Thanks for sharing. Would like to try Dixie Belle paint, seems several bloggers use and love their products.